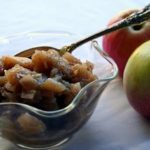 Looking for something different to make with the season’s bounty of apples. Here’s a quick and easy recipe that is a great condiment atop your vegan protein, any vegetable, as part of a vegan cheese and cracker plate, but also atop your favorite vegan vanilla ice cream. 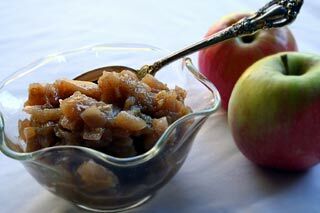 Don’t have Granny Smith apples…you just want to use an apple that is a good firm cooking apple. No apples…no problem. Make this with firm pears, fresh cranberries, or even small diced butternut squash. If in season, hard peaches or nectarines would be equally tasty and delightful. Combine the apples, onion, orange juice, vinegar, coconut sugar, ginger, chat masala, mustard seeds, pepper flakes and salt and in a large saucepan. Bring the mixture to a boil over medium-high heat, stirring occasionally. Reduce the heat to simmer and continue cooking, stirring occasionally, for 50 minutes to one hour, until most of the liquid has evaporated. Take off the heat and add the raisins. Set aside to cool and store covered in the refrigerator for up to 2 weeks.